Escape the urban bustle at The El Yunque Rain Forest and Luquillo Beach. 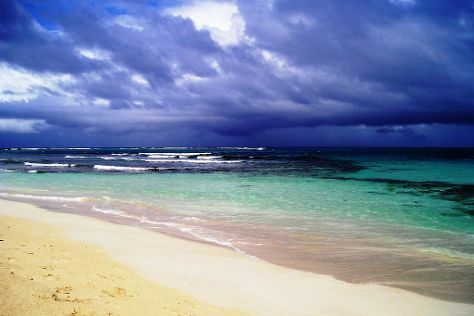 Your itinerary includes some good beach time at Pine Grove Beach and Condado Beach. Next up on the itinerary: get to know the fascinating history of Old San Juan, explore the world behind art at Museo De Arte De Puerto Rico, look for gifts at Spicy Caribbee, and take an in-depth tour of Cathedral of San Juan Bautista. To find maps, traveler tips, other places to visit, and more tourist information, go to the San Juan vacation trip planner. Philadelphia, USA to San Juan is an approximately 11.5-hour flight. The time zone difference moving from Eastern Standard Time (EST) to Atlantic Standard Time (AST) is 1 hour. Plan for a bit warmer temperatures traveling from Philadelphia in June, with highs in San Juan at 90°F and lows at 78°F. Finish your sightseeing early on the 24th (Sat) to allow enough time to fly to Culebra. We've included these beaches for you: Flamenco Beach and Zoni Beach. Step out of the city life by going to Culebrita Island and Tamarindo Beach. There's lots more to do: kick back and relax at Carlos Rosario Beach, tour the pleasant surroundings at Playa Punta Soldado Beach, stop by Zinkowski Art Studio, and enjoy the sea views from Culebrita Lighthouse. For photos, maps, more things to do, and other tourist information, read Culebra trip itinerary maker. Culebra is just a stone's throw from San Juan. In June, daytime highs in Culebra are 88°F, while nighttime lows are 79°F. Wrap up your sightseeing on the 28th (Wed) early enough to travel to Isla de Vieques. Step out of the city life by going to Sun Bay and Media Luna Beach. Visit Blue Beach and Navio Beach for some beach relaxation. There's much more to do: stroll through Caracas Beach, enjoy the sand and surf at Black Sand Beach, get engrossed in the history at Fortin Conde de Mirasol Museum, and see some colorful creatures with a scuba or snorkeling tour. To see maps, traveler tips, and other tourist information, read Isla de Vieques trip itinerary maker. Isla de Vieques is very close to Culebra. Expect a daytime high around 88°F in June, and nighttime lows around 78°F. On the 3rd (Mon), you'll travel back home.